Rustic wood wall sign of natural pine slats, with inspirational sentiment; simple yet refined accent for your home. Constructed in similar fashion to an actual shipping pallet, skid sign includes sawtooth hanger on the back, easy to hang on the wall. Handcrafted in the USA. 'tis grace has brought me safe thus far and grace will lead me home. Amazing Grace how sweet the sound. 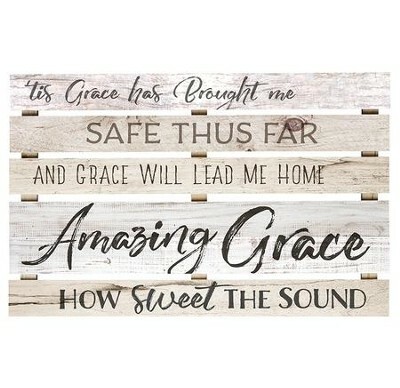 I'm the author/artist and I want to review Amazing Grace, How Sweet the Sound, Pallet Art.